I thought it was some serious 3D CAD/Modeler but it's just a toy. Don't bother. 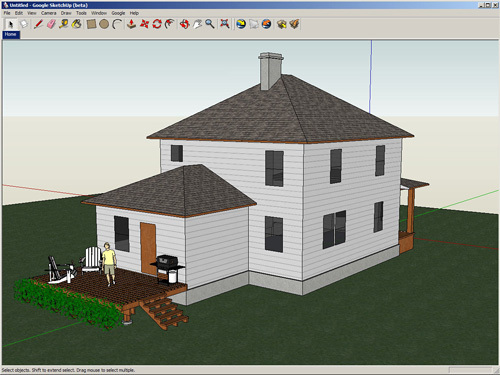 I've been using SketchUp since the @Last days and have used it for planning the building of everything from furniture to remodelling of my house. It's free, easy to learn and use, it's brilliantly effective and runs on Windows XP, Vista & 7. Highly recommended. the tools are very intuitive to use and understand. Unfortunately the file seems to always be corrupted...a file in styles/paper/watermarks doesn't match the cab details...you can opt to ignore and continue the install but good it is not. Pity as otherwise it's an excellent programme. It's a good program to learn 3D on. Definitely easier to use then some of the more professional software packages. Oh, also Google Earth used to be called Keyhole. But as for a company buying software and putting their name on it... ever heard of Yahoo Widgets? Yahoo brands everything with their logo so why shouldn't Google. @lhdal: Google Earth was also bought from other company, and it had even more different name, now i don't remember it but i've downloaded it in the past (free nvidia cards version). Normally it wasn't free so Google just made everyone favour. Sorry for my english, Bye. This program does not claim to support Vista so you have no reason to rate it the lowest score for not supporting it. Should mac users come here and destroy then entire rating system for programs they have never used because they are for Windows? This program is excellent, easy and free. A 5 if it would run on Vista. Ihdal - That is a truly meaningless complaint you have there. Google bought Sketchup, continues to upgrade and release it as freeware and hopes to incorporate it into a broader range of offerings (especially Google Earth) while, just maybe, reaping some small measure of goodwill as it does this. And all you can do is complain that now it's called Google Sketchup instead of just Sketchup. Whiner. I've used SketchUp since it was owned by @Last and I find it annoying someone adding their company name in front. It wasn't @Last Sketchup why Google Sketchup now? Also I'm not a fan of Google's softwarelets and that harms my expectations of the program especially for the future. It's a decent program and really easy to use. But it's not something you can create advanced models or at least easily. Probably advanced modeling + easy usage will never be possible so this will be a very useful tool till people grow up 3D modelling. Most important, Google Earth will be really amazing sometime later with 3D models all around. Where are the Google bashers? Good question. Must not have been time to take thier heads out of thier behinds yet today. Yeah, lets all bash Google for putting out all this cool FREE stuff. What a bunch of morons. If you need professional versions....go BUY them. Otherwise, shut up. Google has been more like SANTA, rather than SATAN...for many people. For a beta this is stunning software! The tutorial is fantastic! Only gave a 4 due to the hangtime on inserting models from catalogue. Beta testing is about real-life application of wares; running map-point, outlook, excel and integrating models into scapes hung my work PC- Dell Celeron 2.8MHz, 512MB, Integrated Graphics for >20s per model... too long! If you wanted to teach a 10 year old CAD, this is the Don. This is a very intuitive approach to 3d modeling, and this program is very very powerful if you dig into it. There is a professional version for 500 greenbacks and the Google version is almost as feature rich as the pro version. the online community is growing rapidly and there are easy to follow tutorials on there site. Google may be satan but if this is hells spawn Im likin it.